Two more beautiful ewe lambs head off to a new home. This moorit badger face ewe lamb is from one of our best lines. The spotted black grey comes from our new ram and out of an excellent ewe who birthed both her lambs unassisted as a first time mom. Both animals are in excellent condition and make a fine addition to the farm they are headed off to. These beautiful ladies are off to their new home at a wonderful farm in New Hampshire. This farmer made some excellent choices. These are two proven ewes with their ewe lambs. 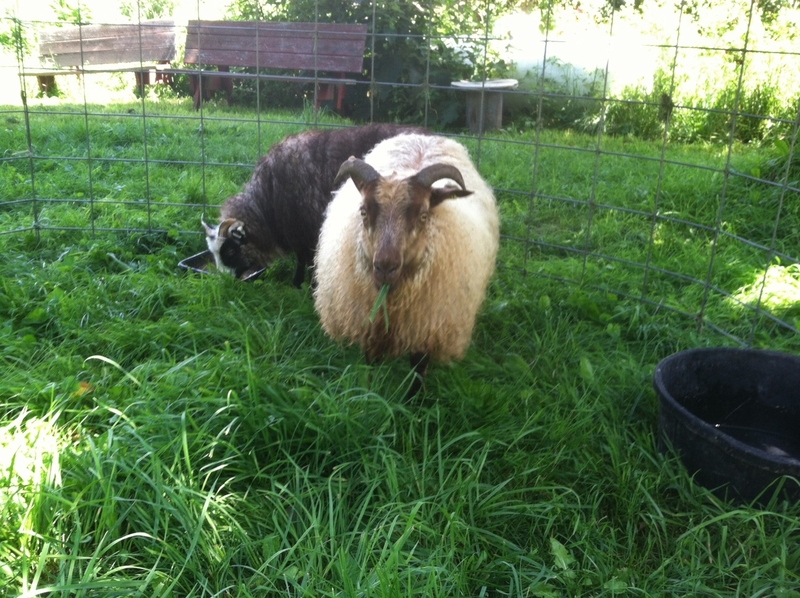 The mouflon ewe lamb and the black-grey ewe lamb will both carry the moorit gene. The mouflon from her sire Ursus, and the black-grey from her Dam. Lots of color and pattern possibilities no matter who these girls are paired with. All have some great AI genetics and friendly dispositions too! We still have many beautiful ewe and ram lambs for sale. Contact us for more information. 802-434-3953. We moved the sows and their little piglets from their farrowing pen to pasture. It's not easy moving pigs. They're big, they're slow, their piglets are milling about like mice and, with all the rain we've been having, they want to stop every time we hit a wet spot and wallow! Brixia went first with her three piglets plus the two from Orange that adopted her (we figure it's cause there was no line at the teats!) We finally got her moved the 1/4 mile walk with lots of coaxing, pushing and maneuvering. That included moving her across a deep fast moving stream...several piglets fell in but we scooped them right back out. Next it was Orange's turn. She turned out to be a lot easier as she is generally an active, curious and high energy pig. We use a small cage built from a welded wire hog panel, with a covering on three sides so that they can only see though the wire in a forward direction. This allows them to see forward as they walk without getting distracted by what's behind them. The piglets were mainly pushed and rolled along. Here are the happy pigs finally on pasture where they will rotate around in large meadow and woodland lots through the growing season. Here they are in a paddock designed to train the little ones to the electric fence.